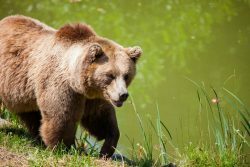 A grizzly bear attacked a hunting guide and one of his clients Thursday night in the Washakie Wilderness. The Cody Enterprise reports the guide, John Sheets of Boulder Basin Outfitters, was field dressing a cow elk when his female client was attacked by the bear. Sheets rushed the bear, grabbed it by the neck and stabbed it with his hunting knife. That’s when the bear turned on him, Sheets told the Enterprise. It dragged the client downhill and chewed on her before returning to bite Sheets’ neck. The bear then dragged the elk carcass on top of Sheets. He also suffered a broken leg in the attack. Both injured people were able to get on their horses and make contact with another outfitter. They are recovering in a Billings hospital. The bear is still at large and Wyoming Game and Fish said there is no action planned against the bear.